Even though I raised four kids myself, I forget how fast babies change. My sister’s twins are crawling already! When she came for a week-long visit, the whole family was excited to spend time with these adorable little girls. My parents’ lawn was still pretty wet and muddy. Parts of my yard were still under water. Yes, that’s what spring is like here. 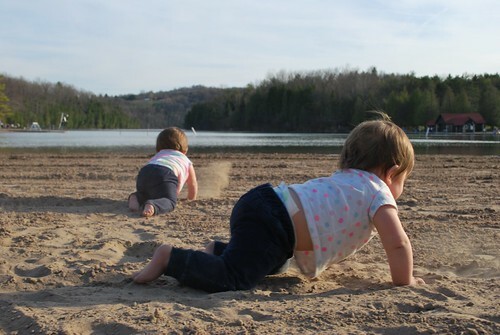 But we took the babies to Pretty Colour Lakes, where the sandy beach had dried nicely in the sun. When we set the babies down, they both took off immediately, scurrying on hands and knees towards the water, like speedy little turtles. How dear. One of my favorite stages for babies, just chubby little dumplings. Faster than speeding bullets - and the epitome of cute. Such cute turtles!! What fun for you! What a fantastic photo! Ah memories. They remind me of my twins, who are now 14. When I would place them down as babies they would crawl off in opposite directions. Oh, how I miss those days! So cute! I'm the mother of twins and the grandmother of twins. Who doesn't get naked in a cemetery?